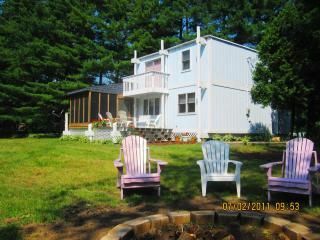 * Beautiful New England style salt box cottage located on Magician Lake in Sister Lakes, Michigan. The property is located at the mouth of Polk Channel, a mile-long waterway excavated in the 1950's, running from Magician Lake through Viewpoint Beach...surrounded by pines and hardwoods that have been growing for a century or more. The cottage is perfect for a family vacation, or couples trying to get away from the hustle and bustle of everyday life. A great week-end get-a-way for a large group...sleeps 12. Pitch your tent! Fish off the dock. Swim and boat at our lakefront lot nearby. Rent a boat on-sight and dock it at your cottage. Fire pit and BB-Q. Experience a real American summer! The Polk family has owned this piece of paradise since 1910. Grandfather Polk began Viewpoint Beach Resort in 1911 with the construction of "Cottage # 1," still in use. Following generations have maintained and improved the properties over the years; Magician Lake is a large, pristine lake with a full range of watersports and activities. Join us to experience a "Real American Summer!" This property is located in a secluded area with a large yard for recreation and get-togethers. Plenty of parking. Unique benefits of this property, and the two nearby rentals (Turtle Cove and Herons Nest) offer a quiet get-away where one can rest or entertain guests in a secluded space. The yard is large with an extended boat dock on Polk Channel. The channel provides access to Magician Lake at both ends of the mile-long waterway, which is scenic, serene, surrounded by forest and is accessible by boats of all kinds. Parking on the grounds is ample. Growing up on this beautiful, untouched piece of Nature was an unforgettable experience. Visitors can ride bikes, walk in the woods, swim, float on the lake with a cooling beverage and listen to the night creatures "sing" at night. Bathroom has a tub/shower combination. Small but adequate. Eight miles from the cottage is the town of Dowagiac with lots of great shopping and eating venues. Visit Caruso's Candy/Ice Cream Shop...in business since 1922. Viewpoint Beach is a quiet place that has been catering to visitors since 1911. Sister Lakes, just 3 miles away, has a grocery store, Driftwood Ice Cream Shoppe and two local breweries. Great restaurants too! The cottage is located on the mile-long Polk Channel, which flows into Magician Lake at both ends. The Polk Channel offers a scenic boat ride, and is a special attraction to lake visitors. The cottage, with its waterfront vista on the Polk Channel, provides boat dockage and fishing opportunities. The channel is home to varieties of wildlife, including our Eagle population. Both the upstairs and downstairs are air-conditioned. Fans also provided. A BB-Q grill and picnic table are located outside. Bring your own charcoal and fire-starter. A full kitchen is provided with stove, refrigerator, sink, microwave, coffee pot, toaster. Eating and cooking utensils are provided along with pots and pans and dishes, cups, glasses. Extensive lawn for yard games and lounging. Space for a family reunion. Three cottages are adjacent to each other and have been rented together for wedding parties and family reunions. Small balcony on the second floor with table/chairs. Kayaks, canoes and paddle boards are available for rent after check-in. Check with owner for availability. Pontoon boats are available for rental after check-in. Check with owner for availability. A deck adjoins the porch with chairs and a porch swing. The property was off the beaten path and conveniently isolate from others. We enjoyed being able to have a firepit right outside and grill. The house was stocked with everything we needed. We loved that the pontoon boat was right there, however we didn't use it due to the weather. We would highly recommand these rentals and look forward to renting them for future visits. Thank you for you generous comments! We hope that our guests enjoy the quiet environment. The lake provides water activities and the Polk Channel, with docks, offers lake access and serenity! Had a girls weekend and the house was comfortable for our group of 7. We had a nice relaxing time, enjoyed the pontoon rental very much. Very nice and friendly people in the area. I’m so glad you enjoyed your stay!! I’m so happy you enjoyed your stay at Frog Hollow! ‘Hope to see you again next summer! Great place to stay, never bored! This property had an amazing, large lot, better than we expected. The owner, Cynthia, was more than accommodating when we had a request. There are plenty of things a family can do on this property to make sure a good time is had by all. We wouldn’t hesitate to stay on this property next summer. We love to share our special place on the lake!! The house was roomy, clean and beautiful foilage around the property. Cynthia was a perfect host. Facilities we're great and easy to get around the area. Couldn't ask for more with golf fishing and swimming. I have visiting this area for over 30 years and the area never changes with it's friendly residents and beautiful surroundings. We value our guests and hope that they enjoy our beautiful lake and the facilities we offer! Magician Lake is spring-fed and is wonderful for fishing, swimming and boating! Swimming, watersports, fishing, tanning, barbequing, nature trails and family activities, to name a few. Jet skis and speed boats can be rented from Lake Effect Powersports or JD's Marine. Pontoon boats, kayaks, canoes and paddle boards can be rented at the Viewpoint Beach site. Campfire stories around the firepit are definitely recommended. The Sister Lakes area has multiple ice cream parlors, a roller rink dating to the 1920's and a multitude of restaurants to enjoy. Downtown Dowagiac features a number of boutique shops, the Beckwith Theatre, the Wood Fire Italian Restaurant, and Caruso's, a candy shoppe and soda fountain that has been in business since 1922. Indian Lake Golf Course is a must of you're a golfer. FIREWOOD: FREE: 2 bundles with reservation. BOAT RENTALS: Pontoon boats, kayaks, canoes, paddle boards. Request fee schedule. Bed pillows provided; Bed linens, towels, paper goods, charcoal for BB-Q not provided. Mattress sizes: 2 queen; Two bunk beds (top bunks, twin/bottom bunks, double); double sofa bed. Check-In: 3:00 p.m. (EST) Check-Out: 11: a.m. sharp! (EST) Rate Details (In US Dollars)Boat Rentals: Pontoon boats, kayaks, canoes, paddle boards...Request fee schedule. Damage Deposit: $250/week Security Deposit Refund: Deposit refunded if there is no damage and cottage is left in broom clean condition. If you choose not to leave cottage in broom clean condition, $50 will be deducted from the security deposit for excessive housekeeping services. Signed rental agreement required Payment in full: $250 refundable security deposit required to confirm reservation. Balance due required 20 days prior to arrival when reservation is made between October-March prior to summer arrival. Until reservation is confirmed, rates are subject to change without notice.